Officials representing three companies – Home Depot, FacilitySource and Stitch Fix – cited three key reasons that spurred the expansion of their businesses to the region: competitive wages, availability of workforce and ample warehouse or office space. 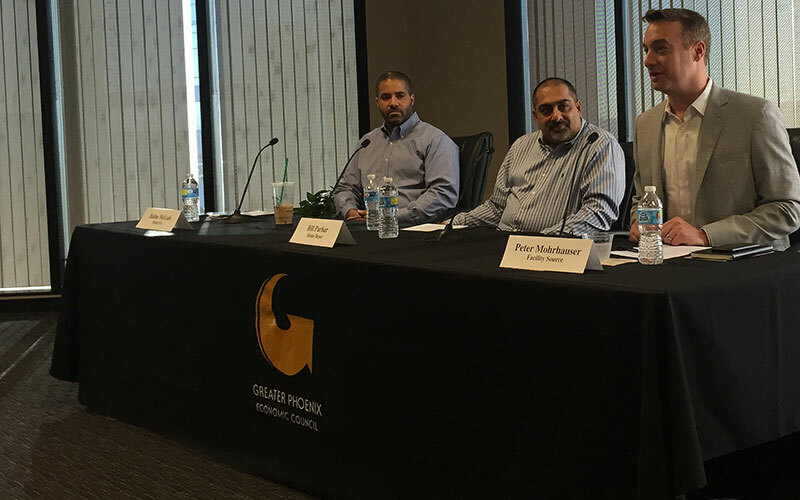 The three representatives spoke at an event hosted by Greater Phoenix Economic Council on Thursday. After moving its regional headquarters to the Valley, the Ohio-based building management company swapped locations from a Tempe warehouse to midtown Phoenix. Mohrhauser called the change “significant,” citing the lower costs and the office’s proximity to the Encanto Boulevard and Central Avenue light rail stop as a plus for employees. He said FacilitySource could look to add as many as 300 new jobs at the Phoenix location. The area has become more popular. Danny Plapp, associate vice president of Colliers International in Phoenix, said vacancy rates in midtown Phoenix have fallen from 28 percent to 22 percent, a much more manageable figure. Meanwhile, Home Depot is headed to Tempe, where director Bill Parhar will head the Atlanta-based home improvement retailer’s online contact center. There are just two such facilities in the U.S. ¬– one in an Atlanta suburb and another in Salt Lake City. The company hasn’t set a timeline for the opening of the Tempe location, but officials expect it to add 800 jobs. Stitch Fix, an online personal styling service geared toward working women, had grown out of its small warehouse in San Francisco and balked at the high costs of renting a warehouse in Los Angeles. Rufus McClain said Las Vegas and Reno, Nevada, didn’t have the labor force or the storage space to accommodate the company’s needs. Left with just two months to find a location, begin construction and hire employees, Stitch Fix’s real estate partner, JLL Services, brought the company to look at properties in the Valley. Stitch Fix decided to house its Southwest operations in a 365,000-square-foot distribution center at 59th Avenue and Lower Buckeye Road, scheduled to open in November. The retailer has centers in Dallas, Indianapolis and San Francisco, as well as offices in Austin and Pittsburgh. McClain said the company hopes to become a fixture in Phoenix.